Using Casino City's Gaming Directory, I pulled a list of all of the executive contacts for United States casinos. In addition to contact information that would be useful for vendors, the database gives information on responsibility order (rank within casino management) and Saluation (Mr., Ms., Mrs., Miss, Dr.). After throwing out those contacts with salutation "Dr.", I used the contacts salutations to identify each of the remaining contacts' gender. Here's the resulting plot of counts of contacts by casino responsibility order. 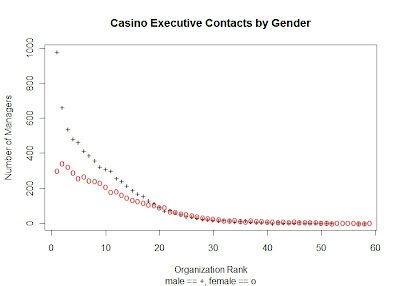 The gender differences in casino management are striking, but my impression is that this is a rather typical distribution of responsibilities by gender. 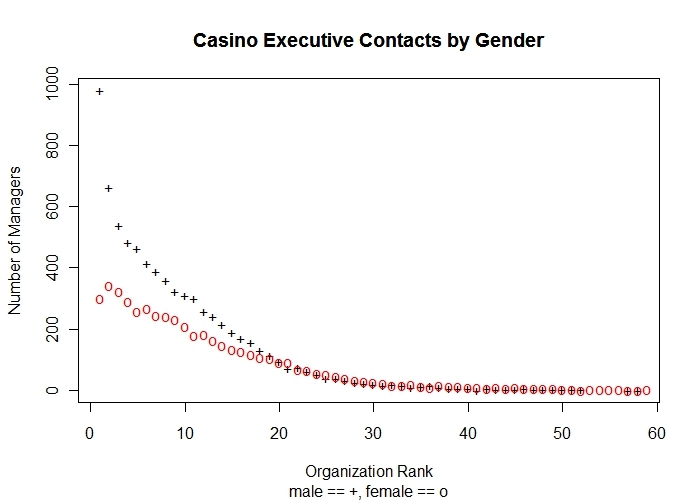 For example, see this NY Times article on gender differences in management, which also explores compensation differences by gender.